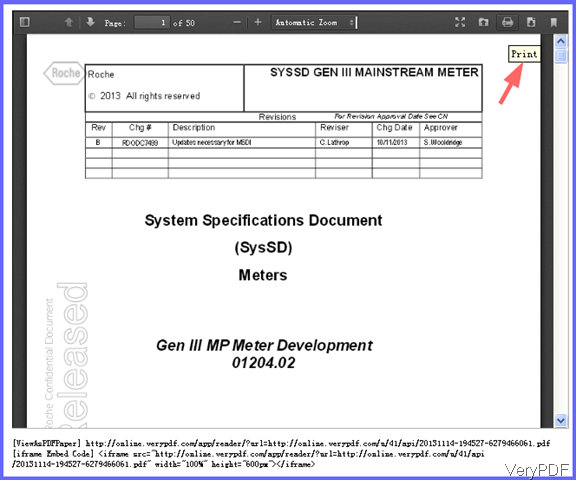 ← How to extract text or recognize text from documents by cloud API? Question: I want to have a print feature in my Android application.Also,my application may cater to varied users and I do not want them to do any PC configurations for the same. Also,I do not know what type of printers they may use.Kindly provide me some knowledge in this regard or how to implement this. I need to print files from Android devices directly, is there any solution on VeryPDF here? Answer: When you need to print files from Android directly, maybe you can have a free trial of this API application VeryPDF Free Online Document Viewer, by which you can upload file, view file and then print file directly from the Android devices. This cloud based API was developed by HTML 5 code, so you can open and use it in Android devices without any problem. Now this software supports the following file formats:PDF, DOC, DOCX, XLS, XLSX, PPT, PPTX, HTM, HTML,TXT, RTF, GIF, JPEG, JPG, PNG, TIF, TIFF, PCL, PXL, PRN, XPS. All those files could be printed directly from Android devices. Please check more information of this software on homepage, in the following part, I will show you how to use this software. Step 1. Upload files that you need to print. Please go to website of Free Online Document Viewer, then you will see website like the following snapshot. Here please upload file you need to print. This website also allows you to upload online file by entering its URL. If you have API code, please input. 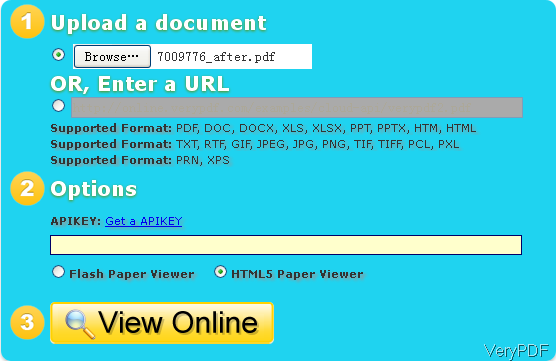 Please choose HTML Paper Viewer. Then click button View Online then you will see a new tab where the uploaded file shown. The newly bounced tab which looks like the following snapshot. There are many options for you to view uploaded file. You can adjust zoom rate according to your device screen size, view file in full screen, download file, and then print file. The printer function depends on browser, so only if the browser supports printing, there is no problem of this function in Android. Please click second button counting from right then you will see message reminding to print. Simply click it then it will be printed to real printer. Actually this cloud API convert all the uploaded file to PDF and then process the print and other functions. There are two links at the bottom of the website, by the first one you can view PDF at any place. By the iframe code, you can embed the uploaded file at any website, blog or other places. By this API and this method, we can print file from Android device directly. During the using, if you have any question, please contact us as soon as possible. How to add producer for your image file? This entry was posted in VeryPDF Cloud API and tagged print file from Android. Bookmark the permalink.